A cassette J card. Brilliant! Design credit for the cover goes to my brilliant partner Megan! Sam Segal = Gala Mess! Man, Kurt has been sneaking into everyone's WFMU studio today (Joe McG also played Prince today). I'm not a huge Prince fan but this and Raspberry Beret I like. It was actually Kurt who introduced me to this tune during one of his epic Prince memorial broadcasts, @NGH. Welcome to the Marathon Madness, everybody! I always liked Prince, but it took Kurt to make fully appreciate and love him. 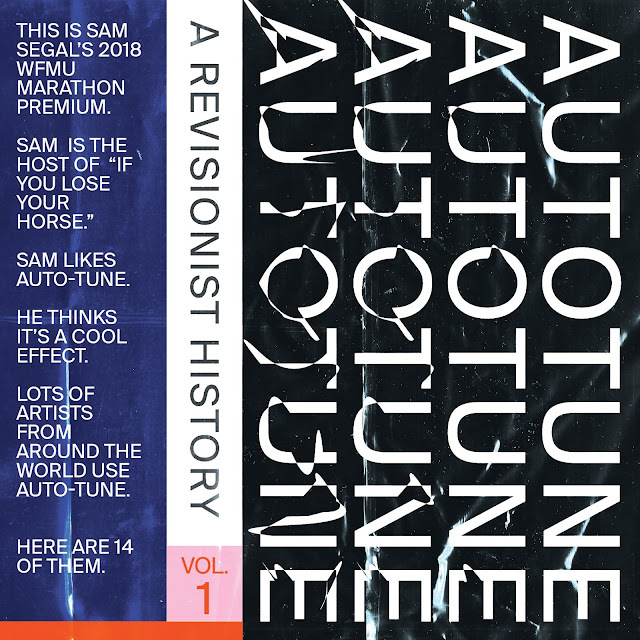 The Autotune cover and the concept both brilliant. Somehow remembered Howlin' Wolf "he doesn't like his electric guitar..." album cover. Wild at the time. Would be lying, if I said I wasn't influenced by that Howlin' Wolf cover, @David. Face it! It feels good! In less than 12 hours I will be airborne! Careful Bodah is a lawyer. I wonder if there is overlap w/ /rupture's 4 hour Magrebi premium? In the phone room, Ike? "airborne event" makes me think of White Noise. Then white noise makes me think of WFMU. We won't autotune out, we promise! Ok, done, time to leave work Thanks Sam, see you before the end. I think you infringed Matt Warwick's territory. I have seen these Les Blank blues films. Amazing, naturalistic stuff. As much IN as about the context of these musicians. Super super highly recommended!! I used to have a poster for Garlic is as Good as Ten Mothers, his film about the Gilroy Garlic Festival. Oh yea! I'm so glad someone has this as a grand prize. Les Blank is treasure! I'm guessing it was a couple of year ago that TCM aired a whole bunch of Les Blank...some I'd never seen. SO great. @UM: Really, I'd never figure! Never figure TCM would feature Blank? They did! "The Blues According to Lightnin' Hopkins" has got to be one of my absolute favorite films about music. That's a great one, @Sam. I liked Always for Pleasure. @northguineahills coming through big, upping his already sizable Swag for Life pledge! This prize will be the steal of the Marathon. You should play Phish until we get another pledge. Wakarusa 2004 wwasn't 30 miles from my house. I'm incredibly jealous of this prize. Moe! How could I have forgotten Moe! I biked two miles to buy their CD from Best Buy as a youngin'! William Parker and Hamid Drake! Always on fire! That's a prize. I have a 5:00 AM wake-up call, so it's time for me to unplug. Go get 'em, Sam and Jeff! Saw the two of them at Vision Festival with Peter Brotzmann in 2014. Love that combo, @David. The ever-present Richard from Metuchen is in it to win it, with a t-shirt sized pledge!! Sez Richard: "Hi Sam, beautiful show tonight!!" Couldn't agree more. Thank you, Richard! I think there's a documentary in the works about Parker and Drake? Or out already? Richard is the Prince of Metuchen, New Jersey! Bless you, Richard! We are going to draw for this gorgeous set of William Parker Quartet recordings in four minutes. Get your pledges in! Get 'em in! I was rooting for Ike. I mean for the DVDs. And Ike got it! Auto-Tuned Ethiopian Orthodox beauty! Found exclusively on my premium. Glad you dig, @Stepchild. Listener Megan from Northbrook, IL has come through with a lovely pledge! Digging the proceedings, Sam. Your choices are always so smart and funky. They’re smaunky. Hitting the hay. Have great last hour! Sleep well, @Doug! Thank you for the endorsement! Jio, what an honor to have your presence on this comment board. Always nice to have you aboard, @Carmichael! Listener Richard in Metuchen, NJ is capping off his radio evening with a fantabulous pledge in support of Sam's show. Thanks, Richard, and sweet dreams. Made it back (had to have two pints and read, today should be the last 12 hour day in a while). Glad you wandered back to the stable, @NGH. Richard in Metuchen is an absolute mensch! I believe I hear Richard pledge in every show so far, even more then once on occasion. Having life happen, and going broke the last few years, my woofmoo karma has come back gave back to me. danks woofmoo! (now that I can pledge again). Greetings Sam, sorry for my prolonged absence, I need advice, if you have any to offer. What troubles ya, @Gilly? You're always welcome here or anywhere else for that matter. Tell it like it is Sam. It's a gas gas gas! Listener northguineahills, throwing down a prize-worthy pledge here in the late innings! Thank you, @ngh! Thank you chap, I can no longer sleep, nothing seems to trouble me, but a presence won’t let me sleep, it’s like I need to say awake. My finals are in two days and I haven’t slept in over a day, how can I chase away the sleep stealing spirits? Access to your ears continues to be one of the great honors of my life, @NGH. Bless you. @Gilly, I am so sorry to hear about your insomnia. Have you tried breathing deeply while listening to ambient music? I listen to ambient binaural beats frequently but thank you for the advice, i meditate, eat healthy, and have a stable life so there should be no problems. I’ll just stay up and listen to Radio Nepal. Santos L. Harper, checking in with one of my favorite avatars on this whole site. BIG UPS to listener Rob down in Savannah, GA! Thanks, Rob! Also you should check out Skinhead punk and Fashwave(Fascist wave) I know you’re not a fascist but it’s fun music, if you have time of course. Wow, would not have picked you for a Skinhead Punk fan, @Gilly! Your tastes are as broad as they come.